A definitive guide to the health, animal welfare, environmental and culinary benefits of grass-fed foods. “Farming is a world of its own, tied more to the ebb and flow of nature than to the pulse of changing food trends.” These words echoed around the globe after Shannon Hayes wrote them in 2004, when the first edition of The Grassfed Gourmet hit the markets, becoming the best-selling grassfed meat cookbook ever written. Shannon changed the world of meat cuisine by grounding it with the commonsense practicality of a farmer, seasoned it with experience from her farm’s meat cutting room, and served it up with a hearty dose of reality that only a parent committed to local food and healthy kids can offer. In this updated and expanded edition, Shannon’s own culinary journey from farmer to foodie and back to the farm resonates as strongly today as it did so many years ago. She has included all the newest data on the nutritional, environmental, social, and animal-welfare benefits of grassfed and pastured meats and dairy products, updated the cooking information with her most recent research, kept all the recipes from the original edition, and tucked in more new recipes and stories than ever before. This is the book that turned thousands of inexperienced readers into savvy meat cooks. It is the book that has turned vegetarians into meat eaters, and the number-one most recommended cookbook by grassfed livestock farmers across the country. 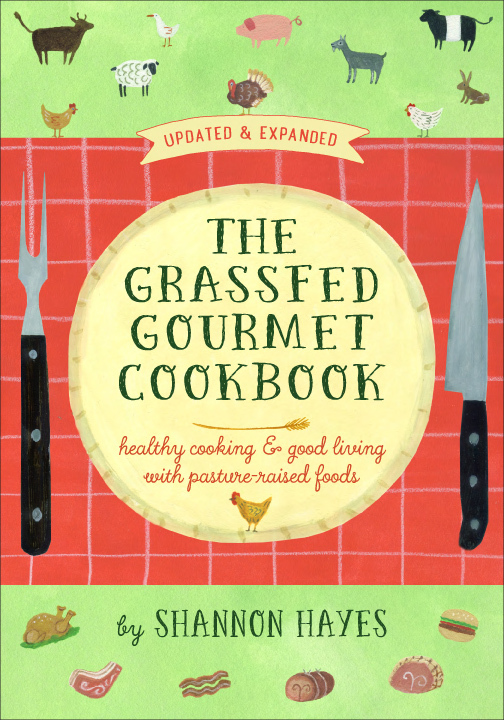 If you are new to the world of sustainable meat cookery, The Grassfed Gourmet is the classic that you will turn to again and again. Simple strategies for finding, preparing, and cooking pasture-raised foods, as well as techniques for getting the most out of your purchases. More than 125 delicious recipes by some of today’s best pasture-based farmers, featuring beef, lamb, pork, venison, bison, goat, veal, poultry, rabbit and dairy products. Countless tools to help farmers market their products, including cutting instructions, explanations for consumers who choose to buy whole, half and quarter animals, and easy-to-read reference charts matching all the cuts on an animal with the appropriate cooking methods.